changes to Uranus's orbit. After being ignored by French astronomers, Le Verrier sent his predictions to Johann Gottfried Galle at the Berlin Observatory, who found Neptune on his first night of searching in 1846. Seventeen days later, its largest moon, Triton, was also discovered. Nearly 4.5 billion kilometres from the sun, Neptune orbits the sun once every 165 years. It is invisible to the naked eye because of its extreme distance from Earth. The main axis of Neptune's magnetic field is "tipped over" by about 47 degrees compared with the planet's rotation axis. Like Uranus, whose magnetic axis is tilted about 60 degrees from the axis of rotation, Neptune's magnetosphere undergoes wild variations during each rotation because of this misalignment. The magnetic field of Neptune is about 27 times more powerful than that of Earth. 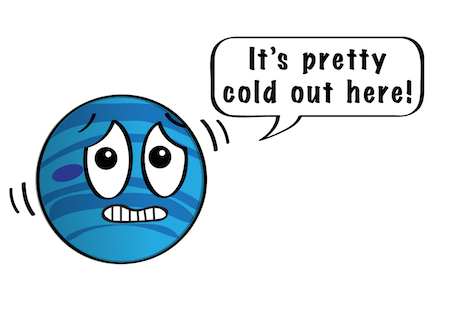 Neptune's atmosphere extends to great depths, gradually merging into water and other "melted ices" over a heavier, approximately Earth-size solid core. Neptune's blue color is the result of methane in the atmosphere. Uranus's blue-green color is also the result of atmospheric methane, but Neptune is a more vivid, brighter blue, so there must be an unknown component that causes the more intense color that we see. The cause of Neptune's bluish tinge remains a mystery. Despite its great distance from the sun and lower energy input, Neptune's winds are three times stronger than Jupiter's and nine times stronger than Earth's. In 1989, Voyager 2 tracked a large, oval, dark storm in Neptune's southern hemisphere. This hurricane-like Great Dark Spot was observed to be large enough to contain the entire Earth. It spun counterclockwise and moved westward at almost 1,200 kilometres per hour. (Subsequent images from the Hubble Space Telescope showed no sign of the Great Dark Spot photographed by Voyager. A comparable spot appeared in 1994 in Neptune's northern hemisphere but had disappeared by 1997.) Voyager 2 also photographed clouds casting shadows on a lower cloud deck, enabling scientists to visually measure the altitude differences between the upper and lower cloud decks. The planet has six rings of varying thicknesses, confirmed by Voyager 2's observations in 1989. Neptune's rings are believed to be relatively young and relatively short-lived. Neptune has 13 known moons, six of which were discovered by Voyager 2. The largest, Triton, orbits Neptune in a direction opposite to the direction of the planet's rotation. Triton is the coldest body yet visited in our solar system - temperatures on its surface are about -235 degrees Celsius. Despite this deep freeze, Voyager 2 discovered geysers spewing icy material upward more than five miles (eight kilometers). Triton's thin atmosphere, also discovered by Voyager, has been seen from Earth several times since, and is growing warmer - although scientists do not yet know why. 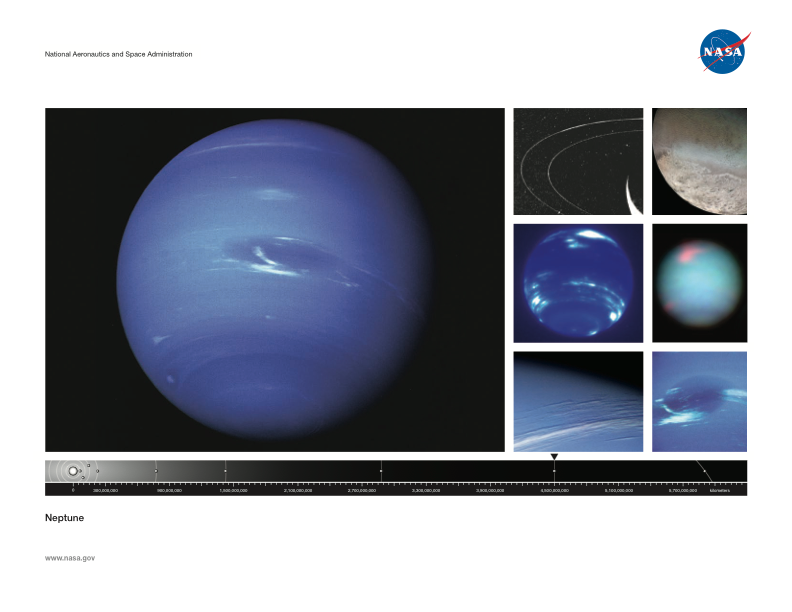 Click on the image below to download the Neptune lithograph and learn more about this planet.